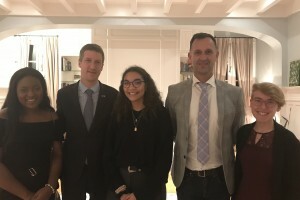 Célia Chemeni, Mr. Vincent Sciama (Consulate General), Marissa Ramsey, Mr. Nicolas Torres (Attaché of Cooperation for French), and Audrey Gibson at the awards ceremony. SHREVEPORT, LA — Marissa Ramsey, a sophomore French major at Centenary College, was honored recently as one of three winners of the Donald Hoffman Memorial Scholarship from the French American Chamber of Commerce-Gulf Coast Chapter and the Consulate General of France in New Orleans. The award recognizing Ramsey’s work as editor of Centenary’s French language newspaper, Le Tintamarre, was presented at a reception in New Orleans on November 30. The Hoffman scholarship is named in memory of Donald Hoffman, the founder and first president of the Gulf Coast chapter of the French-American Chamber of Commerce. The scholarship was created to support projects related to French language and Francophone culture created by Louisiana university students and young professionals. Ramsey presented Centenary’s Le Tintamarre, the nation’s only student-run French language newspaper and the last remaining French language newspaper in Louisiana, as her project. Ramsey will use the scholarship funds to help pay for the printing and distribution of more than 4,000 copies of Le Tintamarre for businesses, schools, and French organizations across Louisiana. The scholarship application process included an online submission and a 30-minute interview conducted in French. Dr. Andia Augustin-Billy, assistant professor of French and Francophone studies at Centenary, brought the scholarship program to Ramsey’s attention and encouraged her to apply. The awards ceremony was held at the residence of the Consul-General of France in New Orleans, Vincent Sciama. Sciama presented the award along with Nicolas Torres, the consulate’s Attaché of Cooperation for French, and Eric Belin, president of the French American Chamber of Commerce. Centenary sophomore Audrey Gibson and French exchange student Célia Chemeni accompanied Ramsey to the awards reception to represent the Centenary French department. Visit centenary.edu/French for more information about French language and culture at Centenary College.